CoreCivic, formerly Corrections Corp. of America, owns and operates the Cimarron Correctional Facility near Cushing, where in 2015 four inmates were fatally stabbed during a gang fight. CoreCivic – formerly known as Corrections Corp. of America – has been in talks with the Oklahoma Department of Corrections and nonprofit Center Point Inc. to acquire the nonprofit’s halfway houses in Oklahoma City, Tulsa and Osage County, according to an Oct. 10 letter from the Corrections Department to CoreCivic. If the purchase of the California-based Center Point goes through and CoreCivic doesn’t close or consolidate facilities, CoreCivic would own more than 70 percent of the state’s halfway-house reentry beds. CoreCivic has proposed closing the Center Point halfway houses in Tulsa and Osage County should the deal be finalized, but the Corrections Department is somewhat resistant, the letter shows. CoreCivic, based in Tennessee, already owns three of the state’s 10 halfway houses and four of the state’s five private prisons. 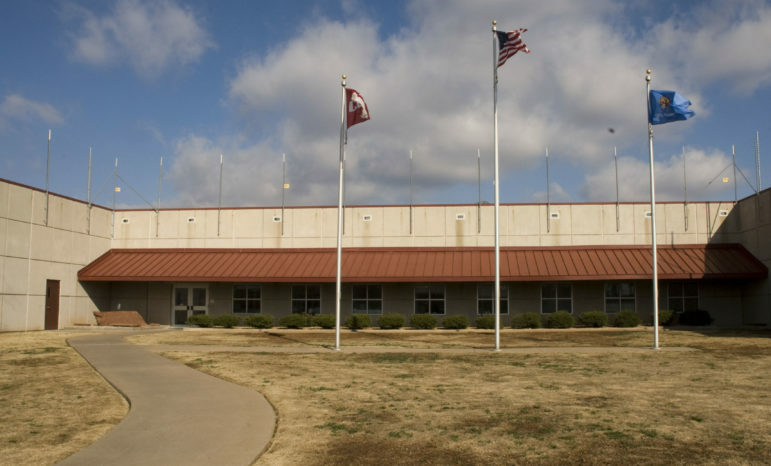 One of those four prisons – Diamondback Correctional Facility in Watonga – is empty, and CoreCivic is trying to convince the Corrections Department to lease the facility for state inmates, according to a recent company conference call with investors. The state now leases and operates CoreCivic’s North Fork Correctional Facility in Sayre. CoreCivic’s purchase wouldn’t be its first in Oklahoma. In October 2015, the company announced it had purchased Oklahoma City-based Avalon Correctional Services, which operated prisoner halfway houses and re-entry services in Oklahoma, Texas and Wyoming. The deal included a 300-bed facility in Oklahoma City, a 300-bed facility in Tulsa and a 180-bed women’s facility in Turley. That gave the company more than half the state’s roughly 1,500 halfway house beds. In an emailed statement, Steve Owen, CoreCivic managing director of communications, declined to give details about the proposed acquisition of Center Point and where the deal stands now. Center Point officials didn’t return phone calls. In recent years, CoreCivic has adjusted its business strategy to focus on three distinct areas: private for-profit prisons; halfway houses, or reentry services; and real estate. Analysts and business writers say private prison companies are likely to benefit under the Trump administration. The U.S. Justice Department recently revoked an Obama administration order to phase out the federal Bureau of Prisons’ use of private-prison contracts. CoreCivic has had its share of controversy over the years. Human rights and civil liberties groups have pointed to several examples of prisoner mistreatment, riots and dangerous conditions at the company’s prison facilities across the country. In September 2015, four inmates were stabbed to death during a gang fight at the Cimarron Correctional Facility near Cushing. The fight was considered one of the deadliest incidents of its kind in Oklahoma prison history. In its letter to CoreCivic, the Corrections Department didn’t object to the potential purchase of Center Point but expressed concern about the company’s plans to close its 75-bed Osage County facility and move the inmates to Tulsa, boosting the number there to over 300, which the department thought was too high. The letter also expressed concern about plans to close Center Point’s female halfway house in Tulsa, which focuses on alcohol and drug treatment, and move its 32 inmates to Turley. CoreCivic owns and operates the Davis Correctional Facility in Holdenville and the Cimarron facility. The company signed a $37.5 million contract in May to lease North Fork Correctional Facility in Sayre to the Corrections Department, which operates and staffs the prison. Diamondback, the fourth CoreCivic prison, has been closed since 2010. But in a Feb. 9 conference call with investors, Cameron Hopewell, CoreCivic’s managing director of investor relations, said the company hopes to convince the Corrections Department to lease the Diamondback facility as well, rather than go through with efforts to build two new state-owned prisons, according to a transcript of the call. The company is still in early talks with the department regarding Diamondback, according to the transcript.